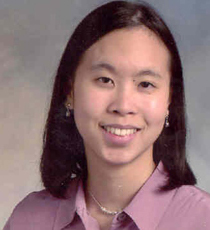 April Maa, MD, is a comprehensive ophthalmologist providing medical and surgical eye care for Veterans at the Atlanta VA Medical Center (Atlanta VAMC). She also contributes to the training of Emory's ophthalmology residents through lectures and direct clinical and surgical teaching at the VA.
She is the clinical sirector of Technology-based Eye Care Services (TECS), a comprehensive tele-ophthalmology program with the VISN 7 Regional Telehealth Service. This novel program, designed to help provide better access to eye care for rural veterans, provides a comprehensive eye screening, eyeglasses, and eye disease follow ups for veterans who live in medically underserved areas using telemedicine principles. The program is a novel method of eye care delivery and was conceptualized, designed, and implemented by Dr. Maa and her colleagues at the Atlanta VAMC in 2015. She is also very active in clinical research at the Atlanta VAMC. Since 2009 she has been an investigator with the Atlanta VAMC's Rehabilitation Research Division's Center of Excellence, the Center of Excellence for Visual and Neurocognitive Rehabilitation (CVNR). She has been the principal investigator on an industry-sponsored study involving diabetic retinopathy screening and is collaborating on other visual rehabilitation projects in the CVNR. Current research includes a clinical trial analyzing additions to the TECS protocol, tele-glaucoma, tele-macula, QA/QI work on the Atlanta TECS program, implementation analysis on the national spread of TECS, and collaboration with industry (Google) to develop software for machine ‘deep learning’. TECS has garnered significant interest from National VA leadership and other eye clinics within the VA system as a potential cost-effective method to help deliver eye care to veterans. With the support of VA Office of Rural Health and VISN 7, Dr. Maa is now working on spreading TECS to other VA hospitals. She is an innovator with the VA Center of Innovation and has received significant clinical grant support from both VACI and Atlanta Clinical Translational Institute (ACTSI) in addition to the VA for her work in expanding eye care access. Her two tele-ophthalmology posters were designated as "Best in Show" at the annual American Academy of Ophthalmology meeting in October 2013 and in October 2016. She is an active member of the Atlanta VAMC Ethics Consult Committee, and is very involved in both medical student and ophthalmology resident education. Dr. Maa has published papers in the field of tele-ophthalmology, diabetes/diabetic retinopathy, health care access/resources, and medical education. Dr. Maa is a member of the American Academy of Ophthalmology and the Association of VA Ophthalmologists.